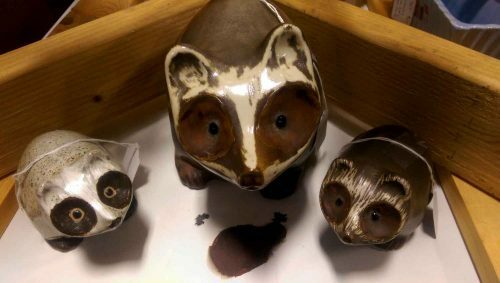 A lovely estate find: a trio of vintage raccoons from the Pigeon Forge Pottery! 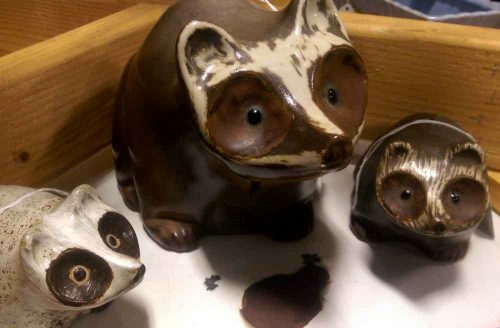 Each is different at all pieces of Pigeon Forge pottery were handmade. (Even if a molded, not handmade piece, all pottery pieces were hand finished). Including one that is quite large, and one in the white crater glaze! The pottery closed in 2000, after Ferguson’s passing. These three pieces are likely from decades earlier; we were told these were purchased annually (or nearly so) when the couple was healthy enough to travel to one of their favorite travel destinations, Tennessee, especially on their anniversary. Authenticate vintage, super cute — sort of a “mod meets rustic,” perfect for lake homes! Currently in our space at F.A.R.M.. We will ship! Call the shop directly at 701-356-9199; or contact us!